I.S.C. 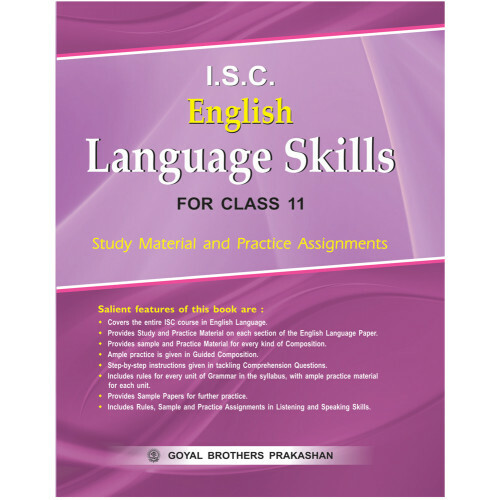 English Language Skills for Class XI is written according to the latest syllabus prescribed by the Council for the ISC Examinations New Delhi. This book has the latest questioning pattern followed by the Council. The book has been designed as a complete English Language Course, providing basic and essential guidance on how to master English Language Skills and achieve full confidence in tackling any question set in English Language Paper I. Space is provided with each question to write the answer. Provides skills needed to write a composition with confidence. It is divided into six units, each unit dealing with one kind of composition. The units are divided into 1. Descriptive 2. Narrative 3. Argumentative 4. Reflective 5. Expository and 6. Imaginative Compositions. Every unit has 5 Solved and 6 Unsolved Assignments. They will help the students to master the art of writing compositions. Subjects are chosen with great care; they include topics within the scope of syllabi. Prepares the student to write a composition based on the information and ideas provided. The assignments given will enable the students to write Reports, Articles, Book and Film Reviews, and Speeches. 5 solved samples are given along with 8 unsolved assignments. This section will make the students thorough in selecting, amplifying, describing and presenting reasoned arguments based on the hints given. Deals in great detail with all the different kinds of Grammar Structures asked in the exam. 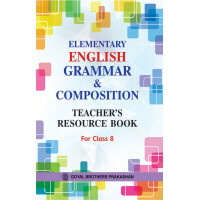 It includes rules, examples and assignments on the following topics : Tenses, Active and Passive, Comparison of degrees, Articles, Prepositions,Direct–Indirect Speech. Besides this it comprehensively deals with the structure of sentences and transformation of sentences. It tackles every type of Grammar question and will provide thorough practice in solving grammar assignments. Step-by-step instruction is given in how to answer all the parts of comprehension. The second part gives practice in how to answer questions based on the passage, howto locate the answer, how to write it in one’s own words and how to infer meanings.Part (c) of question, where summary is to be given, is explained in great detail. Howto first pick out the detail, how to pick out the points and then write them within the word limit is given. Enough practice in the five Solved Passages. There are ten assignments which cover every kind of writing—literary articles,speeches and surveys to practise. 2 Unsolved Sample Papers based on ISC Board Pattern to give further practice. Explains the rules for preparing for a Listening and Speaking Exam. Includes one Solved Listening Skill Sample and One Speaking Skills Sample. Has three Unsolved papers in Listening Skill for practice. One question paper on Speaking Skill with five unsolved topics for practice. To Teachers and Parents Learner English Grammar is for children just beginning to learn En..
Tales From The Panchtantra Book 3..